The ComboBox class in C# represents a WPF combo box control. This tutorial demonstrates how to create and work with a ComboBox control in WPF using XAML and C#. A ComboBox control is an items control that works as a ListBox control but only one item from the collection is visible at a time and clicking on the ComboBox makes the collection visible and allows users to pick an item from the collection. 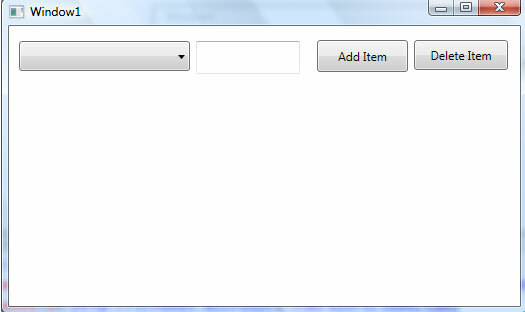 Unlike a ListBox control, a ComboBox does not have multiple item selection. A ComboBox control is a combination of three controls - A Button, a Popup, and a TextBox. 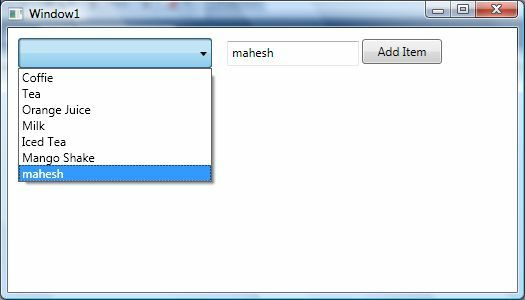 The Button control is used to show or hide available items and Popup control displays items and lets user select one item from the list. The TextBox control then displays the selected item. This article demonstrates how to create and use a ComboBox control in WPF. The ComboBox element represents a ComboBox control in XAML. The Width and Height properties represent the width and the height of a ComboBox. The x:Name property represents the name of the control, which is a unique identifier of a control. The Margin property sets the location of a ComboBox on the parent control. The HorizontalAlignment and VerticalAlignment properties are used to set horizontal and vertical alignments. The code snippet in Listing 1 creates a ComboBox control and sets the name, height, and width of a ComboBox control. The code also sets the vertical and horizontal alignment of the ComboBox and sets the margin. The IsSelected property of the ComboBox control sets an item as currently selected item in the ComboBox. The following code snippet sets the IsSelected property of a ComboBox. A ComboBox control hosts a collection of ComboBoxItem. The code snippet in Listing 2 adds items to a ComboBox control at design-time using XAML. The above code generates Figure 2. In the previous section, we saw how to add items to a ComboBox at design-time from XAML. Now we will add items to a ComboBox at run-time. The Items property of the ComboBox represents ComboBox items, which is an ItemsCollection object. To add and remove items from the collection, we use Add and Remove or RemoveAt methods of the ItemsCollection. Let's change our UI and add a TextBox and a button control to the page. The XAML code in Listing 3 adds a TextBox and a Button controls to UI. The final UI looks like Figure 3. On button click event handler, we add the content of TextBox to the ComboBox by calling ComboBox.Items.Add method. The code in Listing 4 adds TextBox contents to the ComboBox items. On button click event handler, we add the content of TextBox to the ComboBox by calling ComboBox.Items.Add method. Now if you enter text in the TextBox and click Add Item button, it will add contents of the TextBox to the ComboBox. See Figure 4. 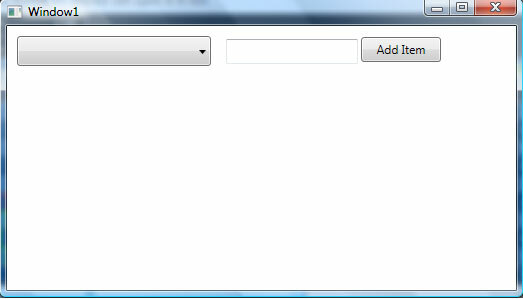 We can use ComboBox.Items.Remove or ComboBox.Items.RemoveAt method to delete an item from the collection of items in the ComboBox. The RemoveAt method takes the index of the item in the collection. Now, we modify our application and add a new button called Delete Item. The XAML code for this button is listed in Listing 5. The new page looks like Figure 5. The button click event handler looks like Listing 6. On this button click, we find the index of the selected item and call ComboBox.Items.RemoveAt method and pass the selected item of the ComboBox. Now if you click on the Delete button click, the selected item will be removed from the ComboBox items. The Foreground and Background attributes of ComboBoxItem represents the background and foreground colors of the item. The following code snippet sets background and foreground color of a ComboBoxItem. The FontFamily, FontSize, and FontWeight are used to set a font of a ComboBoxItem. The following code snippet sets font verdana, size 12, and bold of a ComboBoxItem. The code in Listing 7 sets the formatting of the ComboBox items. The new ComboBox looks like Figure 6. We can put any controls inside a ComboBoxItem such as an image and text. To display an image side by side some text, we add an Image and TextBlock control within a StackPanel. The Image.Source property takes the name of the image you would like to display in the Image control and TextBlock.Text property takes a string that you would like to display in the TextBlock. The code snippet in Listing 8 adds an image and text to a ComboBoxItem. The ComboBox item with an image looks like Figure 7. If you put a CheckBox control inside ComboBoxItems, you generate a ComboBox control with checkboxes in it. The CheckBox can host controls within it as well. For instance, we can put an image and text block as content of a CheckBox. The code snippet in Listing 9 adds a CheckBox with an image and text to a ComboBoxItem. Now we can change the code of ComboBoxItems and add CheckBox and images to all the items as shown in Listing 10. As you may see, we set the name of the CheckBoxes using Name property. If you need to access these CheckBoxes, you may access them in the code using their Name property. Now, the new ComboBox looks like Figure 8. The ItemsSource property of ComboBox is used to bind a collection of IEnuemerable such as an Array. The code listed in Listing 11 creates an array of strings. The following line of code sets the ItemsSource property of a ComboBox to the array. 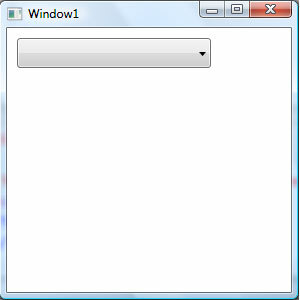 The ComboBox class in WPF represents a ComboBox control. The code snippet in Listing 12 creates a ComboBox at run-time and adds a few items to the ComboBox. Text property of ComboBox represents the text of the current selected item in a ComboBox. SelectedItem represents the first item in the currently selected items in a ComboBox. SelectedValue represents the value of the currently selected item in a ComboBox. SelectedIndex represents the index of first item in the currently selected items in a ComboBox. List 13 shows how to use these properties. In this article, I discussed how to create and use a ComboBox control available in Silverlight. We saw how we can add items to a ComboBox, change item properties, add images add check boxes. At the end of this article, we saw how data binding works in ComboBox.